The kick-off meeting of the LightCoce H2020 project was held in Athens, on 23-24 January at the premises of the project coordinator, the National Technical University of Athens (NTUA). The project focuses on building an Ecosystem for the up-scaling of lightweight multi-functional concrete and ceramic materials and structures. 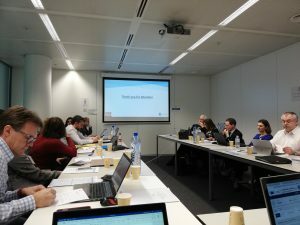 During this two-day meeting, the consortium has discussed the overall project objectives and tasks, including detailed presentations of the five pilot lines provided by the project partners, as well as the test cases that will be implemented by pilot users for the validation of the ecosystems’ operation. A number of services have been considered in order to create attractive and win-win innovation journeys for customers, scaling-up in size and ambition and fully enabled by the project’s pilot plants. Possible barriers which could be encountered during project implementation as well as after the pre-competitive stage were discussed, covering both technical and non-technical issues, with a special emphasis on the creation of a dedicated Non-Profit Organisation which is instrumental to ensure financial sustainability after the project completion. Overall, 26 partners from 9 EU countries will collaborate during the next four years in the LightCoce project, representing 5 Large Enterprises, 8 Research and Technology Organisations (RTOs), 12 SMEs and 1 Association.